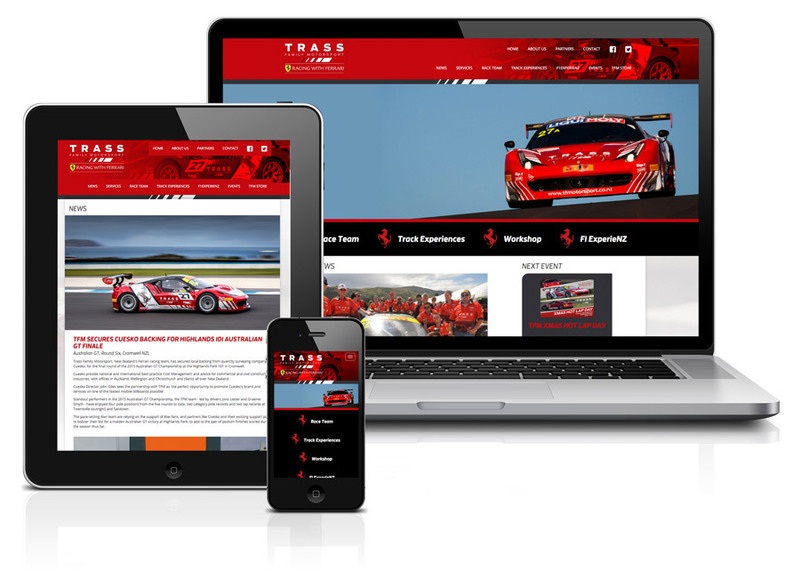 Trass Family Motorsport are New Zealand's Ferrari racing team. TFM is built on the foundations of family, fun and the Ferrari marque, and our passion drives our successes on and off the race track. More than just a race team, TFM offers a range of services and unique Ferrari ride & drive experiences to give fans of this iconic marque a once-on-a-lifetime opportunity in the hot seat. TFM is made up of a skilled team of personnel with decades of experience, a passion for competition, for Ferrari and for the spirit of racing. When Trass Family Motorsport first approached us they already had a good functioning website that was based on an online template site, they wanted to achieve some flexibility in their design and create some unique functionality that would allow them to grow their business and promote new products and services. We delevoped from scratch a new resposive platform that would allow them to publish news items, team information and new services., this included event timing and calendar, online store integration, social and online media.